Parenting Guru: Are you a happy mom? Meagan Francis, author of The Happiest Mom: 10 Secrets To Enjoying Motherhood, wants moms to look for the positive parts of motherhood so we’re better able to cope with the ups and downs. The mother of five shares her secrets below. What does it mean to be a happy mom? 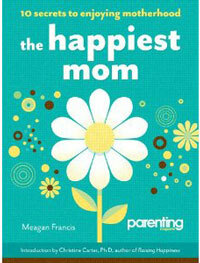 Meagan Francis: Being a happy mom doesn’t mean you’re in a state of constant bliss. It means that you can deal with the milk spilled on the floor, the tantruming toddler and the mound of dirty dishes because you have a reserve of contentment and overall satisfaction to draw from. And it means that, even when you do lose it and flip out, you recognize you really are a good mom and have a good life. You’re able to roll with the punches and move on from the difficult days feeling satisfied with your life. How do you find happiness when the day-to-day chores, struggles and drama seem to take over? Francis: We don’t have to love every single thing we do as parents to love being parents. I try not to let the details cloud my vision so much that I can’t see the joys. I also ask myself often, “Does this really matter?” Or, “Why is this upsetting?” Often the things that seem to be so world-ending just aren’t that big a deal in the long run. And if it turns out I’m upset about something because I think somebody else might be judging me, well, that’s not really a good enough reason to get upset. What advice do you have for mothers going through a hard time and feeling overwhelmed with parenting? 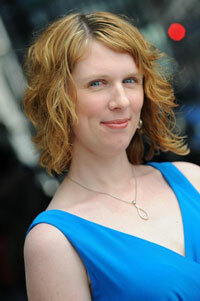 Francis: I encourage moms who are stressed to create routines that make their home lives easier. Something as simple as putting your purse in the same place every day or creating a coming-home ritual for the kids can make a big difference. Embrace what you’re good at and enjoy, whether it’s being a sports team volunteer or being the mom who loves to read out loud or being the mom who tells a great knock-knock joke. You don’t have to — and can’t — do it all. Don’t compare yourself to other moms. You never know the full story of their lives. You’re often comparing your worst days against their best public game faces. How can women live happier lives as Mom? Francis: Be the mom you are (instead of the one you think you “should” be). We all come to motherhood as unique individuals. Being a mom doesn’t magically turn us all into crafting goddesses or automatically give us the patience of a veteran preschool teacher. I look at motherhood as something that can improve us gently for the better if we let it, but it doesn’t change us overnight, and down deep we will always be us. Apologize to your kids when you screw up. Forgive yourself when you fall short. It WILL happen, again and again, because you’re a human being. You haven’t failed as a mom because today didn’t go so well. In the end, what your kids will remember is the big picture: that you were available, showed them love and kept trying.